These days many things compete for the small space of our wrists: fitness trackers; smartwatches; regular old watches; and now the Basslet. 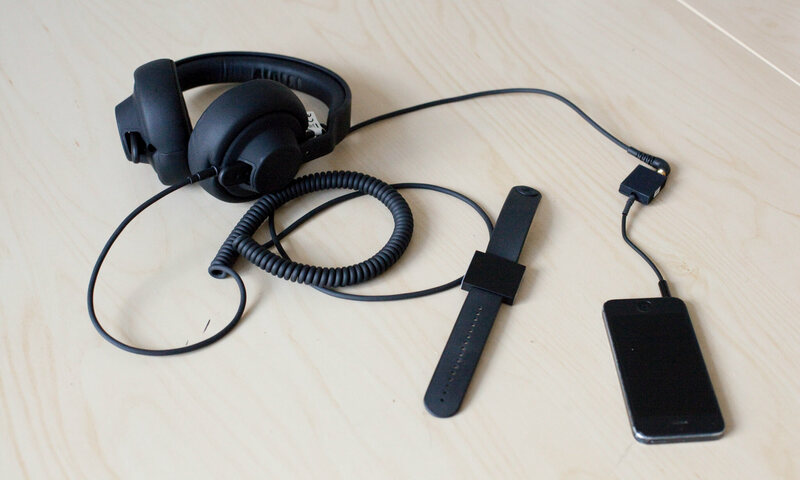 The Basslet is basically a watch without a display, and it comes with a little transmitter device that can plug into anything with a minijack input, like an iPhone, stereo or laptop, and then sends very nuanced vibrations to your wrist. 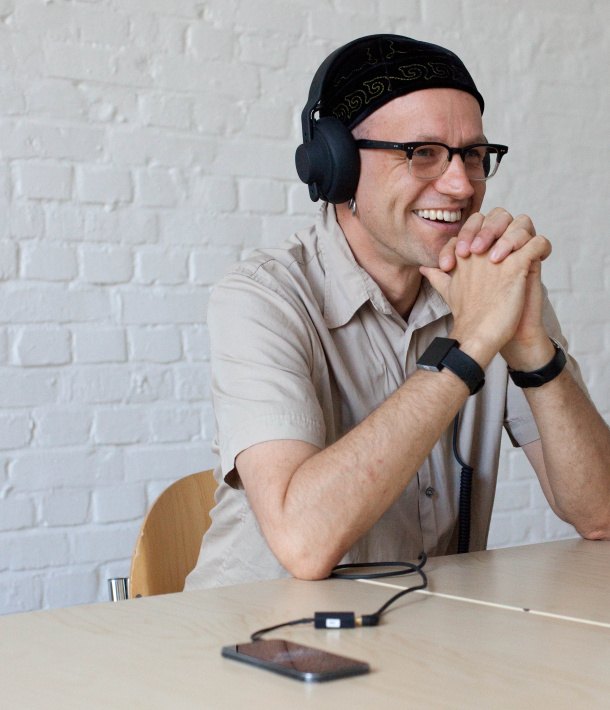 It’s the latest attempt to enhance the perception of sound while listening to music on headphones, which was attempted a few times in the past. For instance, the Subpack is a backpack with a subwoofer, and it’s very efficient—but you have to carry a large backpack around. I heard about the Basslet because I know one of the people behind the startup that produces it, Lofelt, since we worked together at Ableton. All I knew was that he and a few other developers were working on a device, so I was quite excited and curious when I got the chance to test it. I was pretty convinced that it wouldn’t be a waste of my time, but nevertheless I was a bit skeptical, mainly due to the fact that I am not a “headphones person”—I always try to avoid wearing them, even though I own a pair of really good ones. I prefer to listen to music on speakers, maybe because I don’t like to be locked away from the rest of the world. I tested it with a club track from Trentemœller, and the sensation was surprisingly convincing. There’s an element to the experience that you have to get used to—that your brain has to get used to—because the first reaction when the music starts is, “What the hell is going on on my wrist?” But once this initial confusion vanishes, you begin to focus on the music. One of the most exciting aspects of the Basslet is how precise it is; you can feel the contours of the bass and the different frequencies of the low end very clearly. It’s not like it’s just some undefined rumbling on your wrist. The lowest vibration setting is 1, and you can increase the intensity up to 10 on the Basslet itself or through the volume of your music-playing device. I was curious to hear how non-electronic music would work, so I put on “Take Five” by Dave Brubeck. I wanted to see how the double bass did on the Basslet, and again, the experience was fascinating. I could actually feel the stand-up bass and drums perfectly. One thing that becomes immediately obvious is that there are strong differences in how music is produced concerning low frequencies, from highly compressed bass-heavy club tracks to classical music or jazz, for instance. I had to use one of the higher settings for the same intensity when listening to jazz, so it makes total sense to have different level settings of intensity. But to be honest, the lower the vibration’s intensity, the more I enjoyed the Basslet. On the higher levels it can become very obvious. My feeling is that the Basslet’s vibrations don’t have to be that obvious, and the device is at its best when its sensations are very subtle. But technology seems to evolve in such a way that we start with the maximum sensation and then reduce it until it makes sense. Look at 3D cinema; at first we were thrown into this new world that was overwhelming and quite exhausting. Today, most movies use 3D in a very subtle way, and it’s clear that it’d be boring without it. With the Basslet it is very much the same. What’s important is that it’s very precise, which allows it to be subtle while still having a noticeable effect. Turning it off is actually quite shocking, because you instantly miss something. I think there’s still a lot of headroom to optimize the Basslet—not on the mechanical side of the transducer, but on the side of the electronics inside it. I can envision that you could push the experience even further with a little bit of fine-tuning of the frequency response. The has a lot of untapped potential. Looking at it as a music producer, I can imagine this little device could be of great use, but on the road more than in the studio. One of the key components in the creative process is getting in the right mood. If you travel a lot, your working conditions become dictated by the environment, like an airport, hotel room or plane. If the Basslet allowed me to enjoy making music in those conditions more, then I could see it becoming very valuable in the realm of music production. And on a more geeky level, I don’t think it’s necessarily limited to enhance sound experience. Since it’s capable of transmitting such a variety of vibration signals, it could also be used to transmit all sorts of signals for messaging. It could be of great use for blind and deaf people; it could be a communication tool; it could even be used as a navigating system where specific vibrations tell me where to go. The Basslet has a lot of potential there that goes way beyond music.